How much does a Vickers weigh? This article isn’t an extension of my previous blog article about light, medium and heavy machine guns, although it’s something I could rant about quite a bit. When doing an annual ‘spring clean’ of the Vickers collection this month, we had to get all of the guns off of their tripods and give them a once-over. During this, I noticed that one of the guns felt significantly heavier than the others. It was a Mark I gun that had been converted from a Mark XXI when the Australians no longer required them in their armoured vehicles. It was a 1945 gun so one of the last few made and I thought it would be interesting to compare it with one of the earliest guns in the collection – L 1053 from May 1915. This immediately showed a difference of 2.7 kg which equates to an increase of 20% over the 30 years of manufacture. Quite remarkable. It made me think what the differences would be on some of the other examples in the collection. An early Vickers Mark I manufactured at Erith in May 1915. It is extensive lightened and features some of the earliest manufacturing techniques. They include the ‘five-arch’ top cover and side plates with extensive machining. This was very labour intensive and the machining reduces over the period of the Great War as production speeds had to increase to ensure that the needs of the army could be met regarding the numbers of machine guns in service. It was also made with the earliest type of fluted water-jacket. One of the most noticeable accessories affecting the man-carry of the gun was the Sangster Auxiliary Mounting. It meant the gun could be used without the Mark IV tripod in an emergency. It was left on the gun for the majority of the time as it wasn’t easily removed. Weight: 17.21 kg (including Sangster Mount). An Australian-made Vickers originally built as a Mark XXI but then converted, in 1945, to a standard Mark I. This meant that the original features of the Mark XXI, which included different filler plugs at the rear of the water-jacket and the pistol grip removed and replaced with a cross-piece. All the guns of this period feature the dial sight bracket as part of the standard equipment. All of the Australian guns were made with very simply produced components that allowed for mass production. They were made with the smooth water-jacket. Another Australian-made gun but this one was a Mark I made in 1939/40. Other than conversation elements from the Mark XXI, it is the same as B 2296. At the time of weighing, it was fitted with the water-jacket cover and the flash eliminator. Weight: 17.53 kg (including jacket cover and flash eliminator). This example in the collection was built at the end of the Great War, in 1918, as is one of the early examples of a ‘smooth’ water-jacket. It isn’t, in fact, smooth as some excess weight was machined from the water-jacket, presumably by lathe. All other components are, visually, the same as later examples and the early machined components are not used at all. Despite being a Great War Mark I gun, it is fitted with accessories as used in the Second World War. It is used as such for displays with the VMGCRA. Weight: 16.65 kg (including jacket cover and flash eliminator). The example of a Mark I gun was made at Vickers-Armstrongs in Crayford. It was made in 1943/44 and is quite crudely finished compared to the other examples shown here. It has undergone some repairs to the crosspiece as it’s believed that this example was in use with airborne forces and has been parachuted from an aircraft. It is fitted with the water-jacket cover and flash eliminator. Weight: 17.08 kg (including jacket cover and flash eliminator). The variations in weight are affected by the accessories but, given the fact that similar accessories are in use on several of the examples, it doesn’t have a significant influence. Another factor to consider is that all of these examples are deactivated and this involves some metal being removed and some being added. There may be some variations because of the different people carrying out the deactivation work but unlikely to be significant. And of course, none of these are filled with any water so that has to be added when considering the weights that the machine gunners had to carry – in this case the No. 2 of the machine gun team. The table below is a summary of the differences between the different guns, sorted by date of manufacture from left to right and top to bottom. Whilst B 2296 is shown as lightest of the smooth water-jacket examples, it’s possible that this was distorted by the lack of water-jacket cover and flash eliminator. It’s worth adding that the 1914 handbook for the Vickers gives the empty weight as 28 1/2 lb (12.9 kg) so 0.8 kg from the tested weight. 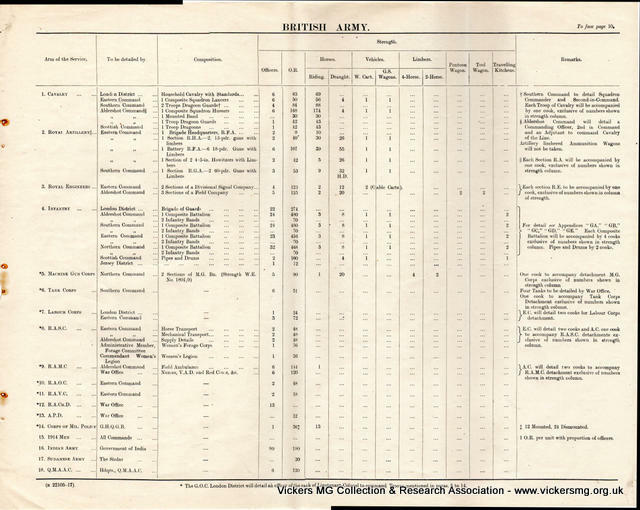 It’s more interesting that the 1945 data summary for the Canadian Electrical and Mechanical Engineers (armourers) shows that the weight of the gun is 30 lb when empty. This is 13.6 kg in metric weight and clearly reflects the earlier manufactured guns, not the later. It would clearly come as a surprise to the soldiers who then went on to carry the gun into action. Well I couldn’t figure out where this fits on the Vickers website at the moment so I thought I’d go ahead and write a blog article about it instead. 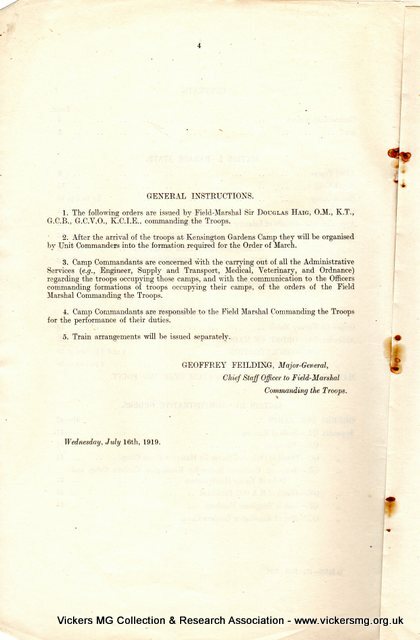 This document was given to the Association last year to digitise and add to the archive as it was seen as something quite important given the Great War centenary that is coming to an end. This reminds us that 1919 was not only when peace was celebrated but much of the Army was still in service and would be waiting to come home for some time. Parade State, covering who was involved and how many of them, which for my purposes includes the men of the Machine Gun Corps. Ceremonial Orders, including the order of march, maps and who was to do what and when. There was a particular concern about how to have the march disperse after the salute as they didn’t want everyone ending up in one place. 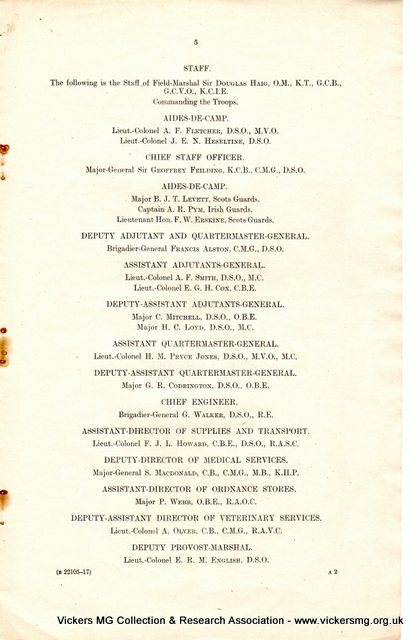 Administrative Orders, covering all of the supplies and rations that were needed to house this many soldiers, sailors and airmen from around the world. 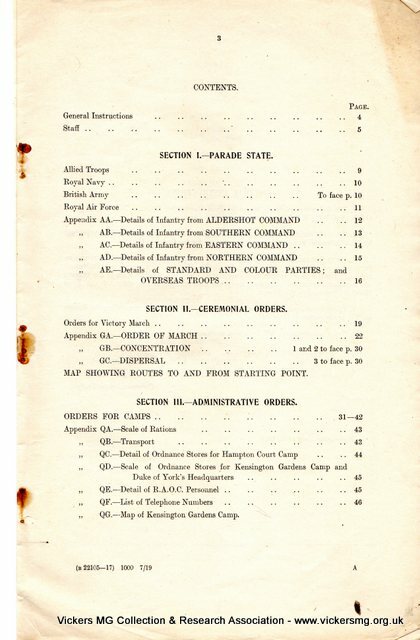 There are sections on the different types of rations that were needed for the international contingents. It also includes the maps of Kensington Gardens showing how it was turned into a camp. It’s a really interesting document to go through and it would be great if something similar would take place in 2019 to commemorate our celebration of peace. It’s available to download as a low-resolution PDF by clicking on the cover below or here. I’ve gone through it and it is readable in most places – sometimes it’s better to zoom out than in. I’ve kept it low-resolution to keep the file size down but can make the high resolution version available upon request (I’ll use wetransfer or something like that to send it across). Either use the contact page, or make a donation and add a message as a note. Over the past few years, I’ve been in the process of restoring some handcarts that were used for the Vickers MG by the Irish Army. Those that have visited the collection will have seen these in progress. They took much longer than I had hoped but I’m very pleased with the outcome, as are the friends that I restored them for. This blog article goes into a bit of detail about the handcarts themselves and then talks through the restoration process that I went through. It appears that these handcarts were only used by the Irish Free State. I haven’t found any written evidence of their existence or period of use but they are shown in Pathe News film clips made in 1940. I’ve also seen a single still photo in an ‘Images of War’ issue on Neutral countries from the 1990s. Four pieces of wood across the base. Wooden box into which the crosspiece of the gun fits. Brass or steel (both seen) buckles on the straps. Horse-hair pads in the leather-covered pads. The wheels are fitted to stub-axles that are detachable with large nuts. These were originally made with finger-pieces to undo without a spanner but replacements of just a nut, albeit large enough to tighten by hand, have been seen. Two types of wheels and tyres have been seen. The ‘Dunlop Handcart’ tyre is narrow, at about 2-inches wide, and appears to be the same type as used on an alternative pattern handcart (possibly for a mortar) and the same as used on the handcarts made for the Airborne Forces. The other type of wheel and tyre is a standard 2.75-inch motorcycle wheel of the period. The example on the handcart still has the brake hub casing as part of the wheel. Gun – by placing the crosspiece in the box at the ‘front’ of the handcart and then resting in the cradle at the rear. The muzzle of the gun rests against a horse-hair pad fitted to the outer sheeting. Ammunition boxes – There are two sets of brackets for a pair of ammunition boxes. The No. 8 Mk I boxes fit and a number of these were sourced from the same location as the carts. Condensor can – In between the two pairs of ammunition boxes, the condensor can fits on a connecting piece. There aren’t fittings for the tripod but this does fit between the gun and the ammunition boxes. A spare parts case will fit into the cart loosely at the end of the tripod space. A spare parts box will fit, loosely, into the spare of two ammunition boxes. Additional equipment, such as the rifles of the machine gunners, picks and spades, could also be carried. When loaded completely and the tripod is in an appropriate place, the cart will balance as the centre-of-gravity is at the axle line. The handle of the cart can be raised and lowered by a butterfly screw at the front. This enables it to be carried by different height soldiers or lowered completely for dragging. It can also be undone and the handle folded back on itself for storage. The length of the handle means it can be used to both push and pull the cart. The wheels can be removed using the nuts on the stub axles. The cart can then be dragged on its base quite easily. It’s well-thought design means that when being dragged the overlap of the sheet steel plates is in the direction that the cart should be pulled. The axles have a piece of steel at the end, outside the first nut but before the washer and split pin. This is a ‘figure-of-eight’ piece with two holes. One goes on the axle but the other can have a length of rope attached to help drag the cart forward. There is a piece of steel tubing at each corner of the cart so it can be lifted by four men when full and two when empty. This meant that they could be carried in lorries and then lifted down by the machine gunners. The first set of images shows the cart in storage for a short while before any restoration work started. They came painted and largely intact but in need of a full strip-down to bare metal and replacement of a number of rotten and rusted areas, then building up again, painting along the way. All leather work would need replacing and the wooden components all needed inspecting once clean to determine whether they could be saved. The first task was to clean the wheels off and see how corroded they were, selecting the best four wheels and tyres from six available for those carts that are likely to be used more. I used soda-blasting after wire brushing the loosest of paint. This is quite a gentle abbrasive and quite harmless as it’s bicarbonate of soda. It does kill the grass though. I wanted to use something gentle as I left the tyres on to start with. It also means that you don’t have to prime bare metal immediately which I needed to avoid as the tyres needed a lot of masking before this could happen. I then began to dismantle the carts themselves and inspect beneath the panels. These are pop-rivetted onto the frame and were easily drilled out. There was a lot of surface corrosion and some deep corrosion on the sides that must have been most exposed to the weather (I suspect these have been stacked and some were on the outside of the stack). The sheet metal panels had rusted through on one cart at the point where they overlap. This meant they would need replacing with a suitable sheet metal material. The inner frame for the ammunition boxes and cradle for the gun is a single piece. It is fixed by two counter-sunk crosshead bolts and two standard bolts. Several of these had seized and needed cutting to remove it. There was no need to take out the wooden box that receives the crosspiece as this can be accessed from all sides once the panels are removed. The frame was stripped of paint using wire brushes and scrapers. This bared the metal suitable for priming. It shows the crude welding and construction techniques used for the production of the carts. Whilst stripping the paint, it exposed some wood that had rotten over time. This was removed and the studs of the screws exposed. These were then ground out and new holes drilled. An initial coat of primer was then applied to the frames prior to reassembly. The wheels were completely stripped, any remaining bearings (although not needed for use) were greased and replaced. Some areas of corrosion were filled and then primed. The panels were also stripped of any corrosion. All leather was removed from the cradle (in place to protect the waterjacket of the gun). The rivets used on this piece were one-sided smooth with washers on the other side. This also protected the waterjacket. The cradle was then primed. The frame was then reassembled while in primer only, and it was sprayed Khaki Green No. 3 mixed slightly darker – a British Standard paint from the period that was similar in appearance to that stripped from the cart prior to restoration. All leatherwork was then cut and prepared. This included re-assembling the horse-hair pads (using a modern alternative) and hand-stitching with saddlery thread. Three different thicknesses of leather were used in the construction of the pads: The 1-3/4 inch wide strap; a thin piece of hide to cover the pad and a thick piece of leather (cut from a salvaged spares case) for the rear of the pads. All holes had to be pierced prior to threading. Stitching lines were copied from the originals that were retrieved from one of the carts but unusable. The carts were then reassembled with the leatherwork, wheels and tyres (including a set of new tyres that had been found, with some difficulty, to replace a corroded set). To show how the carts were used, and to ensure they were all fitted correctly, I used three guns from the collection to complete the equipment. Unless otherwise identified, photos are from the VMGCRA. Pathe Films (1940), On Guard In The Outposts Of Peace [online], Available from: https://www.britishpathe.com/video/on-guard-in-the-outposts-of-peace-aka-outposts-of clip.